Come into your breath, open your body, and quiet your mind. It’s time to align and unwind at our beautiful Hatha yoga Brisbane and Toowoomba classes. Our Hatha classes feature a little bit of everything – from strengthening postures to balances, inversions and meditation. With a slower pace, Hatha is the perfect way to begin your yoga journey, or to perfect your alignment. Discover a class time that suits your schedule. Visit the Toowong yoga timetable, or the Toowoomba yoga timetable today. Hatha is a traditional system of yoga practice that includes both asanas (postures) and pranayama (breathing exercises). 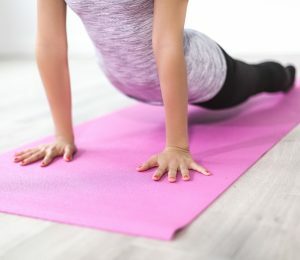 In a contemporary context, Hatha is a generalised term that refers to many physical yoga styles, including Vinyasa, Ashtanga, Iyengar, and more. Because Hatha is more of an umbrella term than a specific yoga style, it can be difficult to know exactly what to expect in a Hatha yoga class. Usually, classes labelled as ‘Hatha’ are on the gentler end of the spectrum. They do not flow from one posture to the next, and often include a balanced mixture of stretches, asanas, balances, inversions, pranayama, and meditation. Hatha yoga Brisbane and Toowoomba is practiced at a slower pace, with plenty of time for you to drop deeply into each posture, and work on perfecting your alignment. After class, you’re sure to feel calmer, more open, and more harmonious. The first translation has ancient implications. The term ‘Hatha’ is thought to have been used as long ago as the 12th Century. Back then, more vigorous forms of yoga (such as power yoga) were not practiced. ‘Hatha’ was therefore used to describe a more physical, forceful form of practice. Ironically, Hatha is now seen as a slower, gentler style of yoga. The second translation – sun and moon – refers to the balancing nature of the Hatha practice. Hatha is a holistic yoga style that incorporates many facets of yogic tradition: asanas, breath work, balances, inversions, and so on. No one dimension of yoga is favoured over another, reminding us that yoga is so much more than a physical practice. Who can practice Hatha yoga Brisbane & Toowoomba? Absolutely everyone, from beginners to seasoned yogis. Hatha is a great place to start if you are new to the yoga practice. The slower pace gives you plenty of time to explore how the posture feels in your body, and allows you to make any tweaks and changes. What’s more, we tend to focus on yoga’s foundational poses – such as downward facing dog. That doesn’t mean Hatha is just for beginners. Well practiced yogis can learn a whole lot in our diverse Hatha classes. Our teachers never teach the same class twice, so you’re guaranteed to discover something new. Plus, Hatha yoga is a wonderful way to reconnect with your body, find harmony, and rediscover your breath. Faster, more powerful class styles have their benefits, but Hatha grounds us in a traditional yoga practice that has withstood the test of time. Still not sure Hatha yoga is the right style for you? Here are three reasons we believe every modern yogi should try out a Hatha class at least once. If you’re the kind of person who tends to strive, to push, to reach for results, Hatha is a wonderful antidote. Hatha classes remind us that yoga is multi-dimensional, and isn’t about becoming stronger, leaner, or more flexible. Instead, it’s about connecting, calming, and nourishing. Hatha yoga can teach us how to listen to our body, and quiet our mind – two skills that can have an incredibly beneficial impact on our day to day lives. In faster, more flowing classes, we may not have the time to make key adjustments to our asanas. In a slower-paced Hatha yoga class, you will have the opportunity to learn proper alignment. That way, you can move safely, and get the maximum benefit out of your practice. Do you feel like you are constantly striving for more, more, more? Whether that be at home or at work – or even at a yoga class – a feeling of always reaching for the next milestone can leave us stressed and dissatisfied. Hatha yoga encourages us to step back, to relax in the present moment, and find a sense of acceptance of and contentment with what is. Freeing yourself from your wants or ambitions is extremely refreshing. Warm-up stretches and gentle poses that start to warm up the body. Standing postures that strengthen, lengthen, and get the heart rate rising. Balancing postures that challenge your proprioception. Seated stretches that work deeply into the muscles and connective tissues. Meditation and relaxation poses to rest, unwind, and completely surrender. All of our Hatha classes are different, so you’ll always be kept on your (yogi) toes! Discover a Hatha class time that suits your busy schedule. Check out our Toowong timetable or our Toowoomba timetable. Feel free to give the studio a call on 07 3162 1652 if you have any questions. We hope to practice with you in the studio soon!